Every team member holds a great deal of knowledge, skills, and energy. And motivation boosts those traits to allow your team to maximize their performance. 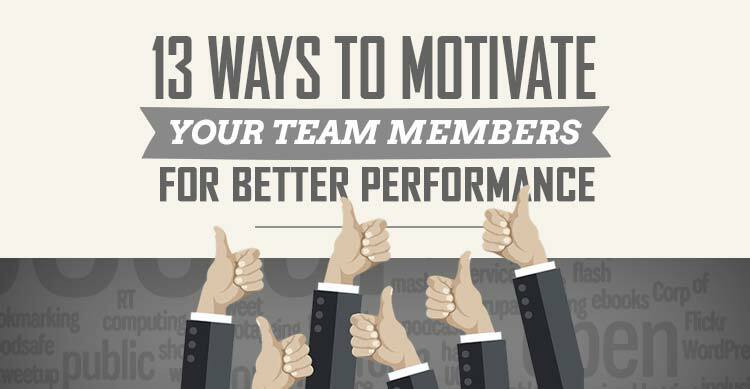 So, how to motivate your team members for better performance?! This article has some great ideas regarding that. Your team members will not indulge with their whole capacity if they don’t get paid the right price. Underpaid employees are more likely to under perform or leave your team. Even a small increase of 5% becomes enough to switch a job. Hence, you can’t risk a highly valuable team member because they don’t get paid a little extra. Of course, you can’t keep increasing salaries for no reason. But a thorough assessment is important. Recognize the efforts of your valuable team members and motivate your team members by offering a salary they deserve. At the same time, make sure you provide geography-specific and industry-specific salaries for your employees. Remember that money is a big factor in the life of a working professional. All your team members sitting together thinking of unique ideas for an upcoming project. Such an exercise cultivates creativity and innovation in each individual. Brainstorming sessions provide team building opportunities for your employees. Every person tackles the same objectives and fights the same problems to come up with unique solutions. You can make this process more fun for everyone by making it a game. Introduce a scoreboard and allow two teams to have a brainstorm competition. When there is a rival team, your team will become more unified in their decisions. Once or twice a year, you can organize a family get-together in the office. Members of your team can become more than just colleagues with each other. But that requires knowing the person beyond a 9 to 5 job. With family days, you can solidify bonding in your team and motivate your team to work for each other. The agile approach is one of the most successful project management strategy applied in the world of technology and other product development. Agile approach focuses on giving importance to each individual in a team. At the same time, each team member can switch work and coordinate with each other, depending on the project scenarios. Agile approach also allows every team to have a motivational leader who bears knowledge of the project and also knows how to maximize the productivity of every team member. If all team members send emails to each other only, they will never work as a unified group. And higher productivity is possible only if they work for collective growth. For that, you will require more intimate ways of communication among team members. Make sure each team member directly communicates with other members. Create scenarios when all members can come together and talk to each other. For instance, you can organize daily morning meetings and allow every team member to interact and engage in communication. These meetings don’t have to be formal or too long. Simple 5 to 15 minutes are enough to communicate daily goals and challenges. Also, provide a communication friendly space for team members. These steps will help in increasing the productivity. Your team members want to achieve organizational goals. At the same time, they want to win as a team. But the ultimate goal for every professional is to find self-development opportunities. If your company can’t offer that, you can’t expect individuals to give their best to the work. As a motivator for higher performance, you can also utilize highlighting development opportunities in your company. Showcase how each individual in your team can attain new places and higher positions. At the same time, you can offer a reward plan for your team. Allow each individual a chance to achieve certain targets and gain incentives. Similarly, you can offer team dinners, sports matches, team holiday and other social activities to motivate your team members. But make sure you fulfill your promise, otherwise, it will backfire in future. To motivate your team members, you need to know them. Their personalities, passion, skills, interests, and ideas matter when you are assigning work. Right person for the right job can make a huge difference in terms of productivity. So, all you need to do is find the interests of your team members and delegate accordingly. This approach is applicable when you are hiring your team members. Also, you can apply the same approach when assigning tasks for a project among your team members. Make sure each individual is interested in the given task. The interest comes if the task falls within the boundary of strengths, passions, personal and career goals of a professional. Every member of your team has unique capabilities. You can see that as a leader. But your team members need to realize the importance of others in the team as well. For that, they need to experience and understand the skills of other team members. If your team has individuals with diverse skill-set, you can conduct skill-sharing exercises. Such exercises are organized to allow team members to teach and learn new skills from each other. So, in a software company, a developer can learn effective code testing from a tester, while a tester can learn quality coding from the same developer. This way, each team member performs as a student and as a teacher during such sessions. It builds a humble sense of confidence in personal growth and team spirit. Ultimately, the overall productivity of your team grows. The workspace also impacts the productivity of team members. You have to provide a well-planned office space. Soothing lighting, comfortable temperature, convenient seating arrangement, and eye-pleasing colors. These are some of the basics of a working space to boost productivity. Apart from the office structure, you can also work on the office culture by allowing co-working opportunities. Professionals with the same passions and interests come together in co-working space to attain their goals. Turning your office into a co-working space will allow more flexibility in your team members. They will learn to adjust and think about the benefit of everyone on the team. You can also construct fun and entertainment areas in your workspace. Using bean bags, unique décor and providing a gaming room are a few great ways to boost productivity. These small elements allow employees a stress-free working environment, which leads to higher team spirit and productivity. Higher productivity is directly related to the use of time during office hours. So, teaching your employees about the value of time can help in increasing productivity. However, this teaching will require some unique methods. For instance, you can utilize time tracking technologies in your office. Ask team members to keep a log of their use of time in office and present reports. Also, ask them to analyze how their own time management skills increase or decrease on a monthly basis. Also Read : Why Employee Engagement Matters? Your team members will feel demotivated if you keep filling their time with unnecessary workload. A systematic approach to work shouldn’t put pressure on a team. And it is your responsibility to showcase that you think about your team members. If a task in unnecessary and the team already has enough work, try postponing or eliminating that extra work altogether. This approach is important if you want to increase efficiency and productivity during a huge project. A little trimming of tasks can motivate your team members to effectively work and give you better results. If you aren’t productive in your work, don’t expect your team members to take you seriously when you talk about productivity. You have to reach the peak of your productivity game in order to set an amazing example for your team. Don’t just stay a senior, become a role model for your team members. No team member should feel inferior in the team. Even an intern should be able to talk to the team leader with confidence. Productivity on projects is possible when there is no confusion. And that is possible with open communication between every team member and the team leader. At the same time, this approach makes every team member feel important in the team. They perform with all their abilities and think more aggressively when faced with a challenge. So, allow this freedom of communication in your team to boost productivity. So, that’ a wrap on this topic. Now, you need to apply all the ideas in your work approach to motivate your team members for better performance.